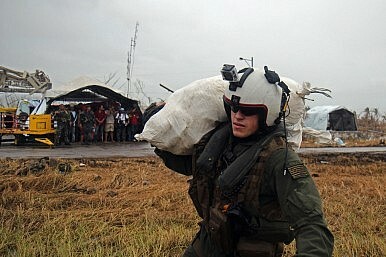 U.S. humanitarian and disaster response capabilities are unmatched. It should work to keep them that way. U.S. Secretary of State John Kerry recently visited Tacloban in the Philippines to witness the recovery efforts following Typhoon Haiyan, which killed more than 6,000 people and flattened an incomprehensibly large swath of land. With Operation Damayan, the U.S. military has once again demonstrated its unparalleled ability to conduct humanitarian assistance and disaster relief (HA/DR) missions, and its performance contrasted sharply with China’s failure to respond effectively to the devastation. Without viewing their responses simply as an HA/DR competition between the two countries, relief efforts have a very real and consequential effect beyond the importance of saving lives, and the U.S. cannot take for granted that it will maintain its current edge – and its accompanying influence – indefinitely. To increase its response time, effectiveness and influence, the United States should work with the Philippines to forward-deploy a hospital ship to the region to augment other U.S. rebalancing initiatives. Such a deployment would naturally complement efforts to establish a rotational troop presence and enhance maritime domain awareness and intelligence, surveillance, and reconnaissance capabilities. China undoubtedly fumbled its relief effort in the Philippines. By initially pledging a miniscule $100,000 in aid – raising its contribution only after being publicly lambasted – Beijing demonstrated that its ongoing maritime disputes with Manila trumped its renewed effort to improve relations with its neighbors. This did not go unnoticed in the Philippines or in the region. Though the People’s Liberation Army Navy (PLAN) sent its Peace Ark hospital ship on a two-week deployment to the Philippines, it was too little, too late. And while Kerry joined Japanese Defense Minister Itsunori Onodera and Australian Foreign Minister Julie Bishop as cabinet officials to recently visit the devastated areas, the highest-ranking Chinese official to visit the Philippines was Rear Admiral Shen Hao, the deputy chief of staff of the PLAN’s East China Sea Fleet and commander for its humanitarian relief mission. Together, these efforts represent a continuation of China’s ham-fisted outreach to its neighbors in Southeast Asia. But Beijing will learn from its mistakes. Aside from building and deploying a hospital ship modeled after those in the U.S. fleet, China has been constructing amphibious assault ships well-suited to conducting humanitarian operations. The U.S. should not only anticipate that the PLAN will build more hospital ships, aircraft carriers and amphibious assault ships – all of which they could deploy to disasters in the future – but also that it will drastically improve its ability to effectively deploy those ships. And though China’s relations with its neighbors, especially the Philippines, have been clumsily handled, the U.S. government must plan for China to be a more capable and active player in the region in the future. China still carries substantial economic leverage as it is the largest trading partner of many countries in the Asia-Pacific. Despite substantial outreach by the United States as part of its rebalancing, China’s massive regional trade will go a long way in helping it regain its influence after some notable foreign policy blunders. As Beijing becomes more adept in its regional diplomacy, how will the United States maintain – and increase – its influence going forward? A critical component will be greater presence, including non-uniformed personnel to augment the U.S. military rebalancing. Though the San Diego-stationed USNS Mercy was activated for a potential operation to the Philippines, it never deployed, in part because other U.S. naval forces were present in the region and there seemed to be sufficient field hospitals to treat the injured. However, it would have taken Mercy two weeks to reach the Philippines and there was no way for the U.S. Pacific Fleet Commander to know whether its unique medical capabilities would have been required. The U.S. response was commendable, but in the future we are unlikely to know ahead of time what capabilities a disaster will require and may not be so lucky. While the Mercy has, over its lifetime, deployed to Asia for months at a time, including Operation Unified Assistance following the 2004 Boxing Day Tsunami, it is not always in the region when disaster strikes. The United States can reinforce its rebalancing and increase its influence in the Asia-Pacific by bolstering assets in the region that might be useful for HA/DR missions. This can be done in part by forward-deploying a hospital ship in the region. U.S. Representative Colleen Hanabusa (D-HI) has asked the Navy to study the option of basing the Mercy in Pearl Harbor, Hawaii and others such as U.S. Navy Captain Henry Hendrix have argued for docking a hospital ship in the Philippines with a caretaker crew along with other assets that would facilitate HA/DR missions. It is time for the two powers to work together on humanitarian assistance and disaster relief.